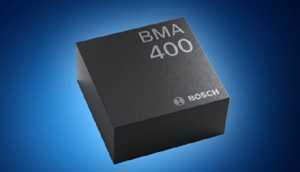 Mouser Electronics is now stocking the ultra-low power BMA400 triaxial accelerometers from Bosch. Offering an industry-leading balance of high performance and low power consumption, the CES 2018 award-winning BMA400 accelerometers draw ten times less current than similar acceleration sensors. Suitable for devices requiring always-on battery systems, the BMA400 accelerometers are ideal for Internet of Things (IoT) and wearables applications. The Bosch BMA400 triaxial accelerometers, available from Mouser Electronics, detect tilt, orientation and tap/double tap, and integrate a plug-and-play, activity-recognizing step counter. The accelerometers feature an output data rate (ODR) of 12.5 Hz to 800 Hz and low pass filters down to 3.2 µA with a selectable bandwidth of 0.48×ODR or 0.24×ODR. The devices have a supply voltage range of 1.71 V to 3.6 V and a 12-bit digital resolution. The BMA400 accelerometers are highly configurable with regard to noise performance and current consumption, allowing designers to easily integrate the devices into always-on low-power systems. The 2.0 mm × 2.0 mm × 0.95 mm BMA400 triaxial accelerometers are ideal for wearable devices — facilitating functions like activity tracking and step counting in fitness bands and smartwatches — as well as smart home applications like indoor climate systems and security systems. Able to detect the difference between random vibrations and emergency situations like broken glass, the high-performance accelerometers help to avoid false alarms. Bosch’s low-power BMA400 accelerometers can also be used for predictive maintenance and package tracking in industrial applications.